March 22, 2018 – CycleHop, one of the largest smart-bike sharing operators in North America, today announced the HOPR electric bicycle, the first e-bike designed for bike share programs that includes electric drive capabilities powered by a portable rechargeable battery pack. 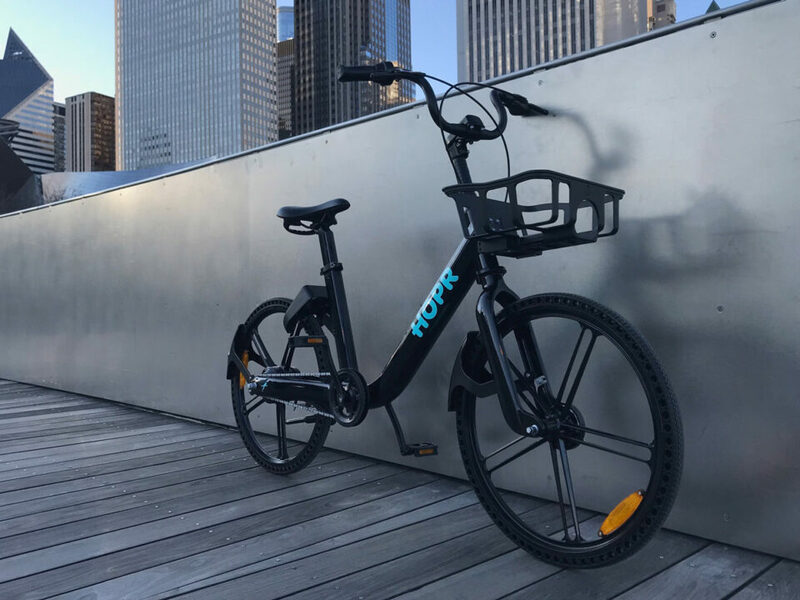 The pedal-assist e-bike is the company’s second offering under its HOPR advanced mobility brand, following the beta launch of the HOPR all transit pass ride matching and payment iOS app in Chicago last week. The HOPR e-bike marks another industry first from CycleHop, whose founder and CEO Josh Squire received the first U.S. patent for bike share in 1999. Designed exclusively for bike sharing programs, the HOPR e-bike combines a durable design with energy from a portable power pack. HOPR e-bike users will receive the power packs, which are about the size of a large smart phone and weighs only a couple pounds, from their local bike share program when they sign up. Users will charge the power packs via A/C outlet at their home or office. The power pack clicks into a port located in the front basket and will provide a boost to riders for a range of 10 miles when fully charged. The pedal-assist motor will aid riders in reaching speeds of 15 miles per hour. When not in use with a HOPR e-bike, the power packs can be utilized as a portable charging device for your tablets and phones. Where available, HOPR e-bikes will work with the HOPR app to provide easy-to-access bike transportation alongside public and private transit including ridesharing options. The HOPR e-bike debuted at the Shared Mobility Summit in Chicago last week, with demo models on display and available for test-rides. The e-bikes will be rolled out this summer in several cities and campuses in the U.S. and Canada. “E-bikes fill a crucial gap in our urban transportation infrastructure. They enable cheaper, quicker trips at distances too close for a car but too far for a standard bike. And they’re perfect for commuters with tight schedules who need to arrive at work or meetings on time without sweating through their clothes. E-bikes offer a no-carbon transit option for people who may otherwise avoid cycling because of the physical effort or distance of travel.,” said Josh Squire. CycleHop is one of the most experienced bike share companies in North America, managing systems in 15 cities and a dozen campuses. They were first to launch bike share in Los Angeles County, Vancouver, Phoenix, Atlanta, Orlando, Tampa, Cleveland, and other cities. CycleHop also led the way with operations of Smart-Bike technology, and their Founder and CEO, Josh Squire, received the first U.S. bike share related patent in 1999. (“Unattended automated bicycle rental station” U.S. patent no. 5,917,407) For more information about CycleHop, visit www.cyclehop.com. To learn about the HOPR all transit pass mobile app and e-bike: www.gohopr.com.